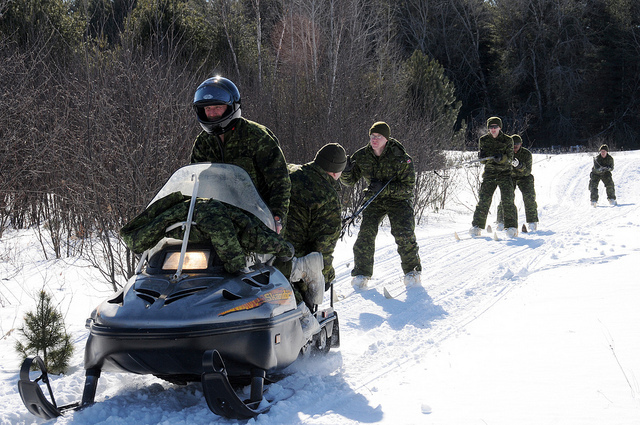 Maybe a little bit of a streatch for the Canadian Rangers, but something that could be a definate asset for the Canadian Forces light mounted recce units conducting complex / cold weather ops. Coupled with current recce platforms these quads could fan out and provide mobility for recce troops tasked with getting eyes on target. The Canadian Armed Forces are looking for someone to provide dog sledding and ski jorring as part of the winter Adventure Training programme for the British Army Training Unit Suffield (BATUS), Canadian Forces Base Suffield, AB. A Light Armoured Vehicle fires the 25mm cannon during a night shoot in the Dundern training area on 13 November 2012. The Honourable Bernard Valcourt, Associate Minister of National Defence and Minister of State (Atlantic Canada Opportunities Agency) (La Francophonie) and the Honourable Rona Ambrose, Minister of Public Works and Government Services and Minister for Status of Women, today announced that the Government of Canada awarded a contract valued at $8.5 million to Peerless Garments, of Winnipeg, Manitoba, for the procurement of enhanced combat uniforms for the Canadian Forces (CF). The upcoming Canada Maritime Conference, organized by The Journal of Commerce, will include a panel focusing on the shrinking of the polar ice cap. Another AMAZING video put up by 2 Canadian Ranger Patrol Group! The Canadian Rangers during an exercise at Fish Lake in Whitehorse in March 2006. The Rangers are celebrating their 65th anniversary in the Yukon by opening a Watson Lake detachment. The chief of the Liard First Nation can now add Ranger Sergeant to his list of credentials. On the eve of its 65th anniversary, the First Canadian Ranger Patrol Group, which began in Dawson City in 1947, is expanding its forces with a detachment in Watson Lake. In September, Sgt. and Chief Liard McMillan, along with Liard First Nation Councillor and now Master Cpl. Jim Wolftail, went for training in Fort Simpson, N.W.T. to become the first rangers ready for service for the new detachment.